...X-band MILSATCOM service. Model XTSLIN-100X-B1 features 100W of WGS linear power in a compact, rugged thirty-two pound package. Drawing only 750W of prime power while at linear RF output, this amplifier is ideal for transportable applications where robust, high efficiency, lightweight and high-temperature operation is required. In addition, this unit has demonstrated the ability to support critical multi-carrier X-Band operation with extremely low leakage levels in the receive band, even for the case with the SSPA in view of the antenna and feed. Model XTSLIN-100X-B1, measuring just 6.8-inches x 10.5-inches x 17-inches, includes an integrated BUC, output isolator and harmonic filter. This amplifier has been developed and is manufactured in the USA, facilitating military procurement and logistics. It is the perfect solution for military users who need high power, high-efficiency, compact solid-state amplification for single- or multiple-carrier X-Band tactical SATCOM systems. System integrators can obtain additional specifications and information from Comtech Xicom Technology representatives by visiting Booth 7009 at SATELLITE 2013, March 19-21, in Washington, DC. 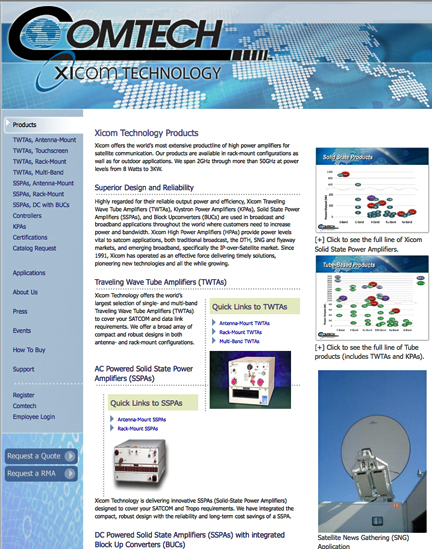 Data sheets for the new XTSLIN-100X-B1 are available on www.xicomtech.com.